Hundreds of people braved a snowy night in Portsmouth to hear 2020 presidential hopeful Kamala Harris hold her first town hall in the state. Some said the first-term California senator already feels like a front-runner. Harris' audience packed the pews of Portsmouth's South Church and spilled out on its steps, where a cheering crowd could watch the candidate speak inside on a big screen. In her answers to audience questions, the former California attorney general backed a slew of progressive policy goals like Medicare for All, the Green New Deal, universal background checks for firearms sales and a path to citizenship for undocumented immigrants. 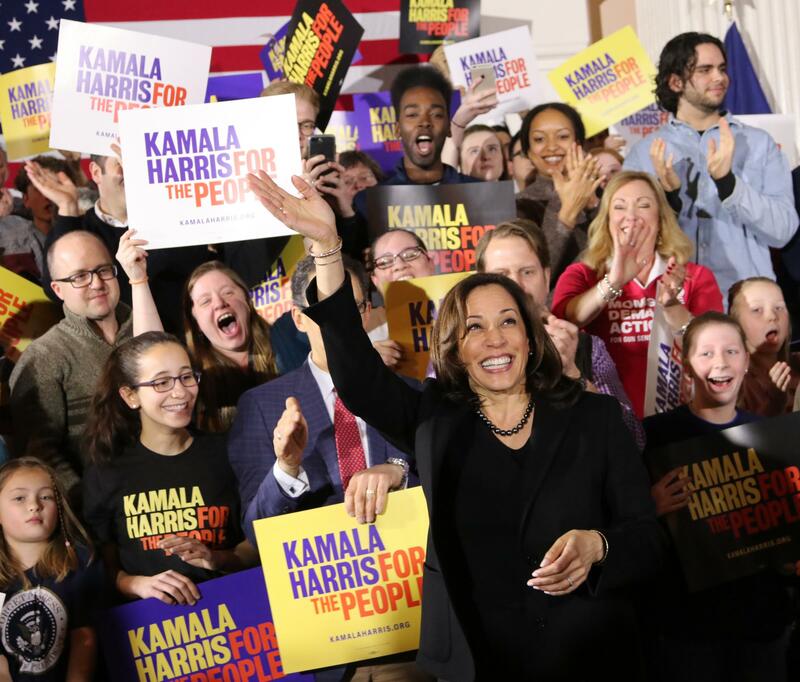 "The way we achieve unity is by understanding that yes, we are diverse, and we have so much more in common than what separates us,” Harris said. Recent polls of likely New Hampshire voters put Harris at or near the top of the declared Democratic field for president. For residents like Robin Lurie-Meyerkopf of Portsmouth, the turnout and excitement at Harris’ town hall felt as though the candidate had already won the state’s first-in-the-nation primary. 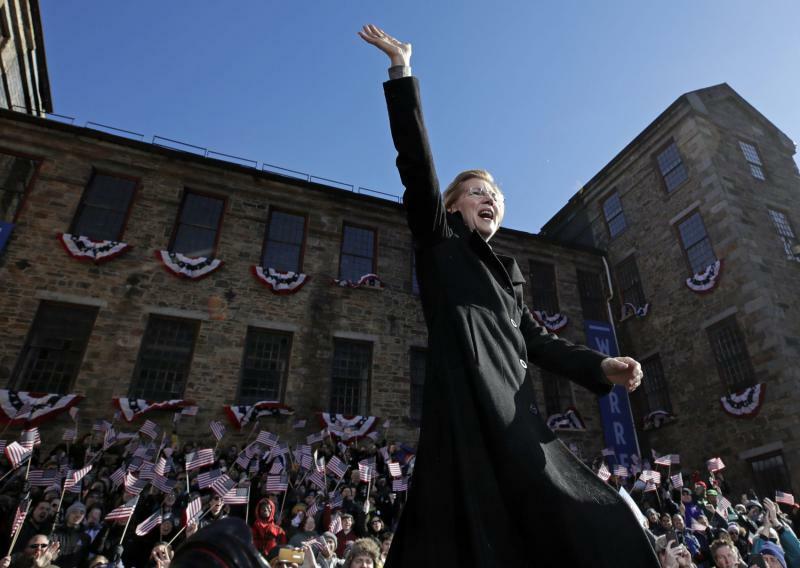 "I've been in New Hampshire since 1980 – I've met a lot of presidential candidates,” Lurie-Meyerkopf said. “I've met them this early in the campaign, and this is crazy here." On Tuesday, Harris makes another traditional early campaign stop at a Politics and Eggs breakfast in Manchester. New Jersey Senator Cory Booker spent the weekend crisscrossing New Hampshire in his first visit since announcing a presidential run. He visited voters in Portsmouth, Manchester, Rochester, and North Conway before addressing over 200 people at a Nashua house party on Monday morning. Booker said he would focus less on partisan politics, and more on finding solutions. “People are starting to lose their faith in us – in our ability to solve our own problems,” he said. Booker touted his years as Mayor of Newark, New Jersey addressing environmental problems, improving school test scores, and fighting mass incarceration. He pointed to the First Step Act, a landmark bill which he co-sponsored and President Trump recently signed, as a bipartisan example of how to help those with addiction who are caught up in the criminal justice system. But he said there was still work to be done to address the mental health and substance abuse crises that often land people into jail. In answer to questions from local high schoolers, Booker said he was for closing loopholes and requiring universal background checks. “And then after that I’d like to do more things, like banning assault rifles and weapons that don’t belong on the streets of America,” he said. A resident of a Nashua neighborhood abutting the Mohawk Tannery, a proposed EPA Superfund site, asked whether Booker would boost the EPA’s oversight and budget. “If I am President of the United States, as a guy who comes from a low-income area surrounded by toxic soil and polluted air, I will fight every single day to make sure we address them,” he said. After a Q&A, voters milled around for selfies with Booker. Ryan Guptill, an attorney in Nashua, said it was too early to decide who he’ll support, but he suspects most candidates will have similar policy platforms. During her swing through New Hampshire Friday, 2020 presidential candidate Kirsten Gillibrand made a stop at an LGBTQ-owned coffee shop on the Seacoast. Standing on the stage at Teatotaller in Somersworth, which would host a teen drag show later that night, the New York senator got emotional as she said President Donald Trump's policies have demonized queer and trans people, like a boy she knows. "That young man is the exact person who should not be demonized by the president of the United States," she said, to applause. "That young man is exactly the person who the president of the United States should protect." She told a trans rights organizer with the state ACLU that she'd support a third gender marker for non-binary people at the federal level. On the opioid crisis, Gillibrand says the public health system should address addiction, "and I would use the criminal justice system particularly to hold drug companies accountable." And she addressed Middle East policy, saying she believes in a two-state solution to the Israeli-Palestinian conflict and does not support the BDS movement, which calls for boycotts of Israel to support Palestinian equality. "I don't think sending troops to Iraq, Afghanistan and Syria will undermine terrorism," she says, adding that defense officials overseas have repeatedly told her that "you cannot defeat terrorism militarily." She added that she likes the proposed resolution’s inclusion of clean air and water policies, which she says would help address the PFAS chemical contamination that’s affected New Hampshire and her home state of New York. Gillibrand also accepted a reusable water bottle from a Seacoast nonprofit. She promised to use that bottle instead of single-use plastics on the campaign trail. The nonprofit, Sustainable Seacoast, presented a similar bottle to Gillibrand's fellow senator and 2020 candidate Cory Booker at another event this weekend. He reportedly promised to start carrying his own reusable bottle. Possible 2020 Candidate Pete Buttigieg Calls Trump’s National Emergency Over a Border Wall “Absurd"
South Bend, Indiana Mayor Pete Buttigieg, mulling a presidential run, spent his weekend in the Granite State. The 37-year-old Democrat made his pitch to a packed room in Raymond on Saturday. Buttigieg said his record as mayor of a distressed midwest city makes him qualified for the Oval Office despite his youth, touting an economic turnaround for the community. “I didn’t say ‘we’re going to make South Bend great again,’” he said to laughs from the crowd. “We talked about how the future wasn’t going to look like the past." Buttigieg has pointed out that his youth also makes him positioned to connect with millennials in a crowded Democratic field. The Harvard educated veteran believes a shift in national policy is needed to benefit those hurt by changes in trade and automation. "We need to recon with the fact that people aren't just losing their income, they're losing their identity,” Buttigieg said. “And I believe that helps to explain everything from strange election results to the opioid crisis." As with several potential Democratic candidates, Buttigieg is a fan of a medicare for all type health care system. He also said he wants more attention on issues like cyber security. Several in the crowd made the trip from Massachusetts. That included Aaron Levin, who said Buttigieg ignites something missing for Democrats. "I've got Senator Warren -- Elizabeth Warren -- who's running,” Levin said. “But I'm with Pete." If elected, Buttigieg would be the first openly gay president. “Service above self,” was the repeated theme of Rep. Tulsi Gabbard’s speech in Concord Saturday night. After the crowd of 50 or so at True Brew Barista greeted Gabbard with a resounding "Aloha! ", the 37 year old Presidential hopeful from Hawaii pledged to walk the United States back from the “abyss of nuclear war," made a commitment to universal health care and promised to work with the global community to address the climate change crisis. Massachusetts Democrats will hold their annual convention in Springfield this fall, but the city's Democratic mayor will apparently not be at the event. A western Massachusetts congressman has announced he'll no longer take money from corporate political action committees.